Automating a certificate request with PowerShell should not be hard – but it is. Exchange has had offline certificate requests with New-ExchangeCertificate since PowerShell was introduced with Exchange 2007. Lync has had online certificate requests using Request-CsCertificate since Lync 2010 and GUI based online requests from the OCS days. I had a requirement to script the request, issuing and importing of a certificate request including multiple domain SAN (Subject Alternate Name) entries. Using native PowerShell features this turned out to be a lot harder than expected. I could not find an easy way to do it so I created a function to generate certificates, request them online from a Certificate Authority and import the certificate. This meant that using the command below I could request and be issued a certificate – as long as I modified the CA Web Server certificate template security permissions to allow either the computer account or all Authenticated Users the ‘Enroll’ right. The certificate could not be exported which didn’t meet my needs and this is not supported on Windows Server 2008 R2 or older machines. CEP and CES are also something we do not see being used a lot, especially not with username and password authentication. The certificates created are exportable and contain the private key. The output of the two offline requests above are shown in the picture below along with the Certificate Enrollment Requests which are waiting to be completed. These .req files can then be submitted to an internal or Public Certificate Authority. 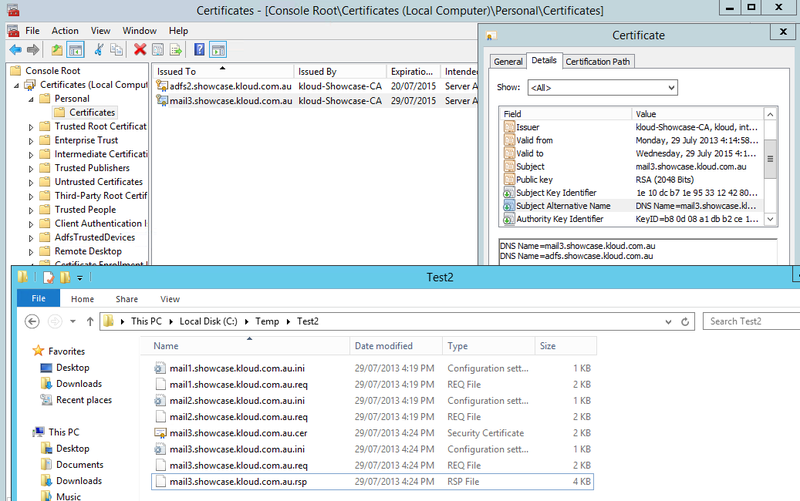 Based on the subject name (excluding ‘CN=’) the certificate request .ini file, request file, response file and certificate file are generated. A new .ini file is created using a basic template depending on whether a single name certificate or SANs are specified and written to disk. Note: The script uses the RequestType of PKCS10 instead of CMC which is given in some Microsoft examples such as http://support.microsoft.com/kb/931351. CMC allows for key archival but is not supported by many public Certificate Authorities. The certificate is then requested using ‘certreq –new’ based on the .ini file and output as a .req file (old versions of the .req file are deleted). If an online request was specified, any old versions of the response .rsp and certificate .cer files are deleted, the certificate is requested from the CA and written to disk as a .cer file. The final task is to import the issued certificate which places it into the ‘Local Computer / Personal / Certificates’ folder with the private key. I now have a reusable function I can put into any script or into a PowerShell profile and easily request a certificate.